I am with you still ~ I do not sleep. I am with you still ~ in each new dawn. It is with great pain and sorrow that I must tell you that my long-time friend and companion, T- Bone (Ch. Nanjay's Prime Cut) crossed the Rainbow Bridge on Saturday, April 5th, 2003 (just one month short of his 14th birthday). I truly believe in the concept that every person has a soul-mate. I see no reason to believe that this soul-mate must be in human form. I know that this soul-mate can be a dog. I know for sure --- because I was blessed with T-Bone sharing his life with me. "My goodness, what a beautiful litter; but what do you want to keep the puppy with the dark front leg for?" "Just look at his face", I said, "just look into those eyes"
"Oh, no wonder,..... yes, I would be keeping him too". .... And so T-Bone's destiny was to be my forever-friend here at Nanjay. T-Bone's registered name was Ch. Nanjay's Prime Cut in memory of his grandfather, Am./Can. Ch. Canamer Prime Time, who passed away around the time that T-Bone was born. T-Bone was a comical puppy, but never one of the "wild" ones. Always a gentleman; even as a baby. 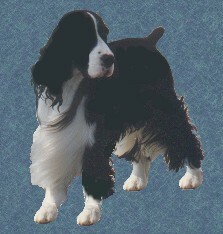 As a puppy, he was shown the "ropes" by my other male springer, Elmer Fudd (Ch. Nanjay's Contender) and they became the best of friends; T-Bone following everything Elmer Fudd did. In turn, when Elmer Fudd crossed over the Rainbow Bridge, T-Bone became the patriarch here at Nanjay, and taught the new boy,"Norbert" (who is now almost ten years old himself) all he had learned. Norbert and T-Bone were constant companions ever since. T-Bone was the official greeter and puppy babysitter here at Nanjay. 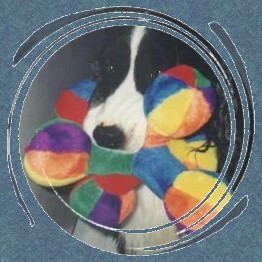 He had a sense of humour, whether he was (carefully) playing with his treasured "stuffies" or clowning around while chasing bubbles. He was always there to cuddle with, cry with and celebrate with. If we just chose to sit and reflect, that was okay with T-Bone; go for a walk; chase bubbles; play with baby puppies - it didn't matter, T-Bone just wanted to be with us. He always sat outside the whelping box when puppies were being born, and all of the new mothers didn't mind him coming in to "visit" their puppies. He played with the puppies, no matter what their age, and was always happy when these grown-up springers came back to visit us. T-Bone always would crawl up on the bed with my son, Corbin, and stay with him until after he fell asleep, and then pop up, come to my room and sleep with me (on his side of the bed, and on his pillow, of course). My son learned to walk by hanging onto Elmer and T-Bone's tails and following them around. T-Bone was a great ambassador for the breed. He introduced several classes of schoolchildren to dogs; often visiting the Montessori school that my son attended. He was the most patient, sweet dog; whether we were in the Toddler and Casa classrooms (student ages 18 months to 5 years of age) or playing with the "big kids" in grades 7 and 8, while I gave a talk on animal husbandry and genetics. 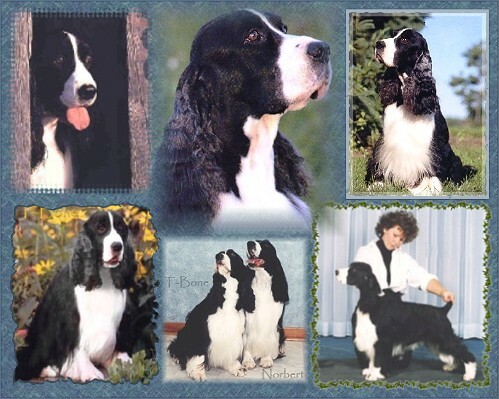 T-Bone exhibited in the conformation ring in Canada and quickly earned his Canadian Championship as a young dog. He didn't enter the ring for another seven years or so - and then he did so at some springer specialties as a veteran. T-Bone has several nice specialty wins - including some Best Veteran In Specialty Shows and Best Veteran In Sweepstakes to his credit. We were all able to see how beautiful T-Bone was when he graced many Browntrout springer calendars over the years. His beautiful spaniel expression and soft sweet face was admired by all. 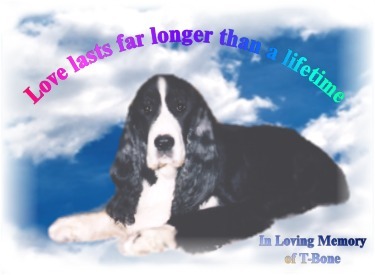 I would like to take this opportunity to thank our webmistress, for preparing this most touching memorial page for T-Bone. I would also like to thank Dr. Ann Voyame, of the Dufferin Veterinary Hospital in Caledon East, who looked after T-Bone and helped to keep him in good health for so many years. Special thanks to Dr. Voyame for coming to my home and so compassionately and gently easing T-Bone to the other side - to the world of bridge angels. I give thanks for the time I shared with T-Bone, treasuring every moment. He gave me love, laughter, devotion and companionship. He has left a void in my heart and a haunting hollow spot in my soul. This page made with love.